On Saturday, the racing world will turn its attention to Dubai, where an impressive slate of eight graded stakes races worth a combined $29 million will be held at Meydan. Headlining the action is the world’s richest horse race, the $10 million Dubai World Cup (UAE-I), in which reigning U.S. Horse of the Year California Chrome is expected to face an excellent field of eight. We’ll be discussing the Dubai World Cup itself later this week, but with so many top-notch races on schedule, I thought it might be wise to get a head start on handicapping some of the other races at Meydan. So without further ado, let’s get started! Much of the attention in this twelve-furlong turf race will be placed on Main Sequence, the two-time Eclipse champion that is unbeaten in five starts since being sent to the United States. His burst of speed in the homestretch is exceptional and his quality unquestionable—he defeated a strong field in the 2014 Breeders’ Cup Turf that included Prix de l’Arc de Triomphe (Fr-I) runner-up Flintshire and the very capable Telescope. But while his credentials are strong, it’s hard to overlook the fact that no U.S.-based runner has ever proven victorious in one of the turf races on the Dubai World Cup program. With this in mind, handicappers might want to try and beat Main Sequence in multi-race wagers, as the champ is bound to be heavily bet in the U.S. pools. Logical alternatives include Flintshire, who lost the Breeders’ Cup Turf by just a half-length to Main Sequence before ending his season with a victory in the group I Hong Kong Vase at Sha Tin. He prepped for the Sheema Classic with a narrow defeat in a March 3rd allowance race at Chantilly, and figures to be ready to roll in his second start of the season. The Japanese pair of Harp Star and One and Only must also be respected, although the latter was not in the best of form at the end of last year, and Harp Star could only manage a fifth-place finish in her seasonal debut on February 15th in the group II Kyoto Kinen. Designs On Rome is another that could contend off of three straight victories at Sha Tin, albeit at shorter distances than the Dubai Sheema Classic. Formerly known as the Dubai Duty Free, this nine-furlong turf race has drawn the U.S. star Mshawish, who has won three straight turf stakes races at Gulfstream Park for trainer Todd Pletcher, culminating with the Gulfstream Park Handicap (gr. I). Interestingly, he has experience in Dubai, having spent the winter of 2014 in Meydan, where he won the group II Zabeel Mile and ran a distant fourth in the Dubai Duty Free. Still, the trip back to Dubai is a long one, and given the lack of success by U.S. runners in the major Dubai turf races, Mshawish is another U.S. runner that could be worth trying to beat at a fairly short price. Among the others, The Grey Gatsby figures to be well-bet off his victory over Australia in the group I Irish Champion Stakes last September, but he hasn’t run since and may find the distance of the Dubai Turf to be a bit short of his liking. A stronger contender might be Solow, who has won four straight races at eight and nine furlongs for trainer Freddy Head, including the Prix Montjue over the Polytrack at Chantilly on March 3rd. With that prep under his belt, Solow should be primed for a good performance on Saturday. Also, keep an eye out for the filly Cladocera, who has won two straight group IIs at Meydan going the same distance as the Dubai Turf. With this six-furlong sprint back on dirt, the three U.S. shippers figure to have a very strong chance at securing the victory. First and foremost among them is Secret Circle, winner of the 2013 Breeders’ Cup Sprint (gr. I). True, he has not won in six starts since then, but that’s not from lack of trying—he finished second four times, and was beaten just a half-length in the 2014 Breeders’ Cup Sprint. He has enough speed to be involved from the start, but has also shown throughout his career that he has enough stamina to run a mile or farther, which will be very helpful given the slow, tiring nature of the dirt track at Meydan. The field is deep, but I think Secret Circle has what it takes to win. The other American entries, Salutos Amigos and Big Macher, also bring good credentials to the race and should be right in the mix as well. Salutos Amigos has won four straight at Aqueduct with powerful late runs, and Big Macher possesses blazing speed that should carry well at Meydan. Among the international shippers, the Hong Kong-based pair of Lucky Nine and Rich Tapestry have both shown good form in group I company, and the latter is proven on dirt, having won the Santa Anita Sprint Championship (gr. I) at Santa Anita last October. I will be the first to admit that I have almost no clue as to who will win this five-furlong turf dash. The local prep for the Al Quoz—the group III Meydan Sprint—saw the top three finishers separated by a head, and with all three back for this race, plus thirteen other runners, this race appears to be one of the most difficult to handicap. Still, I find it hard to imagine any horse outrunning the U.S.-based Distinctiv Passion for the early lead, as the Jeff Bonde-trained runner possesses simply terrific early speed. Three starts back, he won the 6 ½-furlong Midnight Lute Stakes at Santa Anita in decisive fashion after setting fractions of :21.23 and :42.99. Wow! But most importantly, he has shown that same blazing speed on turf, having won a five-furlong turf allowance race at Del Mar last November in the time of :55.60. I’m not saying he’s going to win, but I think he is going to offer a very fair price in the wagering, and he might be worth a look for the chance that he runs his rivals off their feet and just keeps going. This race looks like a rematch between Maftool and Mubtaahij, who were separated by just a head in the one-mile UAE 2,000 Guineas (UAE-III) on February 12th. Of the pair, I think Mubtaahij has the edge going a mile and three-sixteenths, as he proved in his 2 ½-length romp in the March 7th Al Bastakiya Stakes that he has no trouble with the distance, whereas Maftool has not run since the Guineas. However, I also think that Sir Fever has a major chance to pull the upset. The Uruguayan Triple Crown winner won his first ten starts in Uruguay before being purchased by Godolphin and shipped to Dubai, where he finished second in the Al Bastakiya in his seasonal debut. He should be sharper in his second start off the layoff, and will add blinkers for the UAE Derby. Mubtaahij and Maftool look difficult to beat, but I wouldn’t count out Sir Fever. During the coming days, I will be sharing my thoughts on the Godolphin Mile and Dubai Gold Cup in the comments section of this post, and on Thursday, I will put up a new blog post with my analysis of the Florida Derby, Louisiana Derby, and Dubai World Cup. It’s going to be an epic Saturday of racing—I hope you’ll join me to discuss the races all week long! 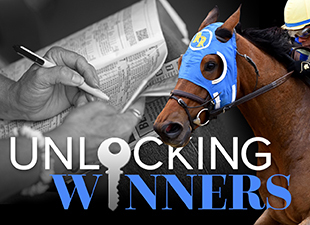 In order to aid in keeping track of all the Kentucky Derby prep races and results, I will be posting links to the Kentucky Derby prep race schedule and the Kentucky Derby point standings at the bottom of each Unlocking Winners blog post from now until the Derby. Also, here is the link to the complete entries and current standings for our "Road to the Kentucky Derby" Handicapping Challenge. Don't forget that from March 23rd to March 27th, you can add three additional horses to your "Road to the Kentucky Derby" contest stable!